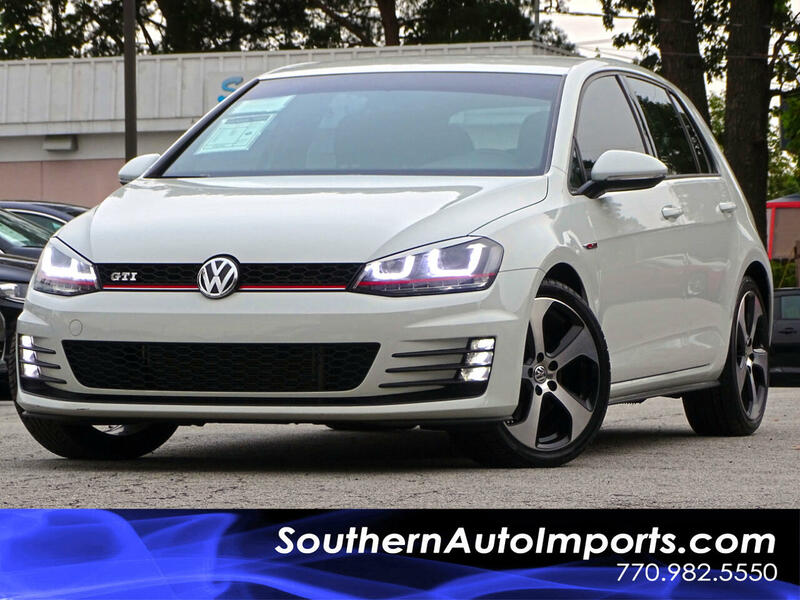 **GTI S MODEL**CALL US TODAY AT 7709825550 TO GET THIS GTI TODAY** WHITE ON BLACK INTERIOR CLOTH SEATS . 2.0L TURBO 4 CYL A/T . BACK UP CAMERA . AUX AUDIO INPUT . BLUETOOTH . HID HEADLIGHTS . HEATED MIRRORS . HEATED SEATS . MP3 RADIO . SATELLITE RADIO . LEATHER STEERING WHEEL AUDIO CONTROL, VOICE CONTROL, AND CRUISE CONTROL . DISPLAY TOUCH SCREEN . PWR LOCKS, WINDOW, MIRRORS & SEATS . GTI STEERING WHEEL . HID RADIO . MAINTENANCE PERFORMED AT VOLKSWAGEN DEALER . DONT MISS OUT ON IT CALL NOW! !